Standardized test scores are not the only measure of a school’s quality. These tests are designed to assess an individual student’s performance as compared to all students nationally. They do not compare one school’s quality to another. Many factors should be considered when choosing a school, including educational philosophy, curriculum quality, teacher credentials, class size, location, cost, availability of resources, discipline policy, opportunities for parental involvement and communications. Each year, Johns Hopkins University Center for Talented Youth (CTY) conducts a talent search based on standardized test scores. To qualify, 4th-8th grade students must score in the 95th percentile in the verbal, total math and/or total battery. Monsignor Slade is proud to announce that this year 13% of our students are eligible to participate in JHU's Center for Talented Youth programs. The IOWA Assessments are given to all students in grades 2 through 8 every Spring. The assessments measure student performance in reading, language arts, mathematics, and in grades 3, 5, 7, & 8 also science and social studies. All of the items on the IOWA evaluate either Basic Understanding or Thinking Skills. Scores on the IOWA are calculated using national norms. This means that students’ scores are compared to the scores of all students nationally who took the same exam. The national average is the 50th percentile. 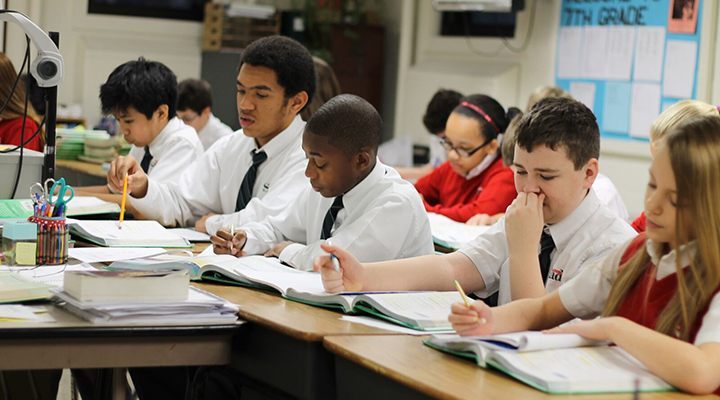 Assessment of Children Religious Education (ACRE) Exam – This test is taken in the Fall by 8th graders and in the Spring by 5th graders.